The editors utilize their 50 years of combined experience in professional engagement with the behaviour and ecology of wild felids to draw together a unique network of the world's most respected and knowledgeable experts. For the first time, this inter-disciplinary research programme is brought together within a single volume. 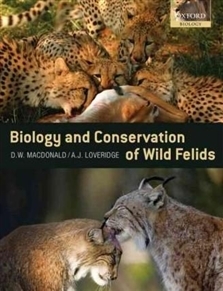 Beginning with a complete account of all 36 felid species, there follow 8 comprehensive review chapters that span all the topics most relevant to felid conservation science, including evolution and systematics, felid form and function, genetic applications, behavioural ecology, management of species that come into conflict with people and control of international trade in felid species, conservation tools/techniques, ex situ management, and felid diseases. 19 detailed case studies then delve deeply into syntheses of the very best species investigations worldwide, written by all the leading figures in the field. These chapters portray the unique attributes of the wild felids, describe their fascinating (and conflicting) relationship with humans, and create an unparalleled platform for future research and conservation measures. A final chapter analyses the requirements of, and inter-disciplinary approaches to, practical conservation with cutting-edge examples of conservation science and action that go far beyond the cat family.